On March 7th 2019 staff and pupils alike celebrated World Book day in style by dressing up as their favourite book character. There were book quizzes in the library, competitions and some wonderful book reviews! A Dalek also made appearance! Year 10 GCSE Media Studies pupils travelled to Disneyland Paris for GCSE Media Studies Live where they heard presentations from Cally Beaton, VP Viacom International Media Networks, Lucy Brett from The British Board of Film Classification and Andrew Davies, Media Speaker, Consultant and trainer. Well done to Caine Harrison for asking the panel a question. This conference was a great opportunity for the pupils to see the practical applications of Media Studies as well as enjoy all that Disneyland has to offer. In preparation for Year 11’s GCSE English Literature examination in May; Year 11 visited the RSC rehearsal rooms and worked on key extracts from play. The focus of the day was looking at the character of Macbeth and analysing his key speeches. The pupils all commented on how useful they found the workshop in deepening their understanding of the play. The day was rounded off at Pizza Express where pupils enjoyed pizza and gelato. Our Year 11 GCSE Food Preparation & Nutrition students have now completed their practical cooking assessment where they showcased a range of skills. The task was to create three dishes from the Asian culture with consideration given to presentation. They have researched Asian foods and completed a number of trial practical’s leading to their final three courses. Our students were creative and showed a wide range of practical skills and they should be very proud of their achievements. 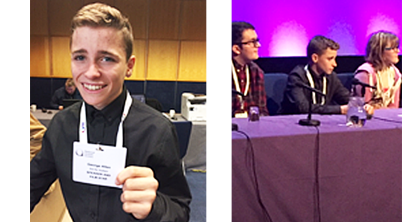 On Friday March 8th George Allen was a speaker on a panel at the National Autistic Society Professionals conference at the ICC in Birmingham. A year ago, he created a film with a group of autistic students to explain the experience of autism to teachers, in particular. The film has won an award at a New York film festival and is being shown in schools and workshops nationally. The auditorium was massive but George did a great job of answering the questions put to him. Well done George! We are very proud of you! Rainbow Class and Orange Class walked, wheeled and ran a mile for Comic Relief. They raised a lot of money! Mrs Marshall joined in the fun too! On the 11th February, thirteen Year 9 students and four staff went on our annual visit to the Calvert Trust in the Lake District. On the Monday, after our ‘epic’ four hour journey up the M6 and a different country roads, we arrived, raring to go. Over the subsequent four days, our students took part in a wide range of activities, ranging from bush-craft, canoeing and swimming, high ropes and climbing. All our students showed a great enthusiasm and desire when undertaking different challenges and over-came their fears and anxieties. Our students were an absolute credit to the school throughout the week, and received lots of positive comments from the different staff members. Also, I would like to give a massive thank you to Mrs Saunders, Miss Pinfield and Mrs Smith for their help and support throughout the week. In readiness for their GCSE Spoken Language Examination Year 11, 12 and 13 GCSE English Language pupils attended a Talk the Talk workshop to bolster their confidence in public speaking. Pupils were encouraged to speak on a variety of topics and to practise confident communication skills with one another. Congratulations to Alex Carvell and Lucie Shaw for achieving ‘Best Speaker of the Day’ and to Olivia Cockayne and Joe Rice for achieving ‘Most Improved Speaker of the day’. Well done! We are very proud of you! Good Luck to all pupils in their GCSE Spoken Language Examination! Year 11 GCSE English Literature pupils travelled to Birmingham to hear Simon Armitage, Oxford Professor of Poetry, read his collection of poems and poems from the AQA Power and Conflict cluster of poems which the pupils are studying. Gillian Clarke and Daljit Nagra were inspiring and read from their collection of poems. Carol Ann Duffy, Imtiaz Dharker and John Agard all gave the pupils valuable insights into the GCSE poems the pupils will be examined on in May, this year, when they sit their GCSE Literature examination. Poets responded to pupils’ questions and discussed how their poems connected to other poems in the Power and Conflict cluster. Peter Buckroyd, chief examiner for GCSE Literature spoke about the two skills vital for success in the GCSE Examinations. The first session looked at how pupils might deal with unseen poems in the exam, both how to think about them and how to write for the best possible results. The second session looked at comparing poems and how to write effectively about them in the exam. All pupils commented on how valuable they had found the day to their revision of the poems. We are very proud of Tyler Inman Year 7 who won a national award for being an inspiring young person. He collected his award at a huge awards event in London in January. Well done Tyler. Congratulations to George Logan and Xavier Stott in Year 9 for winning Warwickshire Schools Library Service W9BA2018 Competition 3! George and Xavier produced a video which championed the novel ‘Shell’ by Paula Rawsthorne. Well done boys! We are very proud of you! On January 10th, 2019 Year 10 and 11 GCSE Literature pupils visited the New Theatre in Oxford to see their GCSE Literature set text Macbeth performed. This powerful performance of Macbeth from the National Theatre, under its director Rufus Norris, was gripping throughout. The play was set in a post-apocalyptic world; Michael Nardone was a powerful and convincing Macbeth as was his wife, played by Kirsty Besterman. The pupils all enjoyed the performance and many commented on how seeing a live performance enhanced their appreciation of the stagecraft and deepened their understanding of the play. We are delighted to announce that Connor Langhorn has won Warwickshire Schools Library Service Competition 2. Connor’s winning Diary Entry was based on the novel Outwalkers by Fiona Shaw. Congratulations Connor – we are very proud of you! “It’s your turn now!” To which I groggily, replied. “Not now, not yet” I didn’t want to lose that dream. The cold morning air bit my skin as I wandered out to stretch my legs. The dew moistened my trainers so that I would have to have walked today with freezing cold feet that would probably go numb at some point. The long grass licked at my hips as I scrambled to find a flat bit of ground that wasn’t pocked with mole hills or rabbit holes where I would twist my ankles. The faint voices of Poacher behind me and Swift ahead was good enough reassurance that today was going to be a good day for making progress for the convoy of a dozen or more children all on their long voyage to Scotland. Jet had recently arrived back with yet another rabbit in his jaws and his tail was wagging madly with excitement to see me again. This was going to be an interesting day; I feel full of hope and less of apprehension. I shall see you again tomorrow, same time same place. Between these pages hold my secrets and life story. On Thursday November 29th, 2018 GCSE Literature pupils in Year 10 and 11 travelled to Birmingham to attend lectures on their set GCSE Literature text, Macbeth. Pupils listened attentively to four lectures which covered the themes of fate, suffering and death in the play as well as the presentation of the supernatural and ambition. Pupils were encouraged to look closely at the language and dramatic structure of the play and were given tips on how to write analytically in the GCSE examination. Good luck to Year 11 this week who are sitting their mock examinations! On 27th November year 8 went to Cadbury’s world. This tied in with their history topic. It allowed them to learn about the growth of the chocolate industry from its beginnings in the Tudor times and the effect of Tudor exploration on the Aztecs. They were also to consider careers in chocolate making and have a go at creating with chocolate themselves. The students enjoyed their day and managed to avoid eating too much chocolate! On Tuesday 13th November Exhall Grange commemorated the 100 year anniversary of the armistice with a whole school history day. Mr Allton–a re-enactor and expert on the first world war –gave talks to all the year groups on being a soldier in the first world war. This allowed students to look at the weapons and uniforms the soldiers used and to try them out –the uniforms, obviously, not the weapons! Throughout the rest of the day students were able to be creative making flapjacks, memorial plaques, art work and poetry themed on the war. Many of the students had researched relations or soldiers with their surname they could put on the memorial plaques and the stories discovered were, in many cases, very moving. Students also learnt about the first planes and had a go at creating their own paper planes, investigating what improved their flight. Mr Robinson created an altar on site with poppies created in art lessons and the day finished with a remembrance assembly with readings of poetry and remembrances from the war. The students showed great respect, enthusiasm and empathy during the day and, hopefully, gained a deeper appreciation of why remembering the war and the sacrifices made is so important. On Tuesday November 13th, 2018 GCSE Media Studies pupils travelled to Birmingham to visit the BBC Mailbox. Pupils visited the BBC Midlands Today studio where Nick Owen popped in to meet the pupils. Pupils visited the BBC Radio Asian Network Studio where they learnt about the equipment a Radio Presenter might use and the pupils had the opportunity to create their own radio drama. The pupils will now be studying their first close study television media product; Doctor Who – An Unearthly Child. Students at a Exhall Grange Specialist School in Coventry have opened a new café to help improve their job prospects. Café Grange is now open for business and it is hoped that the new enterprise will offer life-changing career opportunities for students interested in catering and hospitality. The café is based in an old school kitchen that has been completely transformed thanks to a £40,000 Skills for Employment grant from Warwickshire County Council. More than 40 people attended the official launch of Café Grange. Caroline Parkhouse, assistant head teacher (Post 16) at the school in Easter Way, Ash Green, said: “We are open during school hours and we are looking at opportunities to supply lunches for nearby businesses at Prologis Park. Year 13 student Heidi Davis said this is the start of a new and fun time for the whole school and surrounding businesses. She said: “The food we serve is really tasty and all homemade. As I am currently heading towards a career in catering, being in the café has helped me to learn new skills and develop the ones that I already have. In preparation for the Year 7’s study of Shakespeare; they visited Stratford-upon Avon for the day. They were treated to a performance of ‘A Comedy of Errors’ and visited the exhibition entitled ‘The Play’s The Thing’ at the top of the Swan Theatre. After eating lunch in the grounds of the theatre they then walked to Shakespeare’s birthplace where many of them discovered hidden acting talents! It was a wonderful day and the pupils learnt a huge amount about Shakespeare’s life and works. On Thursday October 11th, Year 11 GCSE Literature students were treated to Stephen Daldry’s multi award-winning production of JB Priestley’s classic thriller, An Inspector Calls, which the pupils are studying as part of their GCSE Literature course. On their return to school, the pupils enthused about the performance and they all commented how useful they found it to their interpretation of the play. Here is a wonderful picture of some of the students at Exhall Grange School in Warwickshire taking part in their long list speed dating event. Pupils will now have 2 months to read the shortlisted books and share their views/thoughts with fellow students, librarians, and teachers. They will then vote for their favourite book and the winner will be announced online in Dec 2018! On 25th September year 8 went to Bosworth to begin their history topic on Tudors. After a look at the memorial and site of the battle the students were introduced to the Master at Arms who drilled them in their bill use whilst avoiding cannonballs, arrows and the enemy. After a look round the exhibition and chance to dress in various pieces of armour, the students also got a talk on archery and the damage various arrows could do to soldiers. Students are now experts in decapitating the enemy with farm implements and first aid on arrow injuries! The weather was glorious, the students beautifully behaved and a credit to the school. Well done, year 8. In preparation for the pupils’ GCSE English Literature examination; Year 9 and Year 10 were treated to a spell binding performance of Macbeth. Christopher Eccleston’s performance as Macbeth was captivating as the audience shared in his demise from a highly regarded patriotic subject to murderer and tyrant. Niamh Cussack was brilliant in her portrayal of the manipulative and calculating Lady Macbeth. All the pupils agreed what a gripping and exciting performance it was. – Mrs Stephens – English Curriculum Lead. On Tuesday the 3rd of July, years 6, 7, 8, 9 and 10 had a visit from Wonderstruck who explained all about rockets and explosions – in the playground then we didn’t set all the fire alarms off inside! Then students spent the morning building their own rockets in groups before firing them across the field. In the afternoon the students built fan powered cars and adapted them to make them go as fast as possible. After various heats in the classrooms, the best 8 cars competed in the hall. Congratulations to George Allen, Callum Inglis and Austin Barnacle who made the fastest car. All students really engaged with the day, worked well with a mix of peers from different year groups and – hopefully – now have a better understanding of the opportunities and excitements that Science, Technology, Engineering and Maths can offer. On Friday 8th June, Mrs Melville went along to the final of the BBC2 500 words competition broadcast as part of the Chris Evans Breakfast Show. Over the past 2 years Mrs Melville has been helping to judge the competition and this year was one of those invited along to the presentations. This meant Mrs Melville had to be at Hampton Court Palace at 5:30am on Friday morning to have ID and handbags checked before being allowed in. Once in, the show went ahead, with music from John Newman, Bastille and Alexandra Burke and presentations and readings from a host of celebrities including David Walliams and the Duchess of Cornwall. Chris Evans was absolutely brilliant and a real champion of the stories and the value of children reading and writing. Maybe next year someone from Exhall could write a story that impresses the judges and gets them an invite to get up very, very early one Friday! Our Primary swimming gala was held on Monday 11th June. All Primary took part in races organised by Miss Bridges and compered by Mr Brookes. Everyone received a participation certificate and we all enjoyed cheering each other on. Exhall Grange and the Cadent EmployAbility team had been in talks with Sandra Trainor, HR Business Partner of GEFCO UK, to consider hosting a 10 week trail placement based in the Warehouse at their Head Office at Pro-Logis Park. Following a site visit and an introduction day at GEFCO, Liam was offered his 3rd placement based at GEFCO UK. Liam began his placement on 16th April and after an intensive induction day, Liam was introduced to the Warehouse Team and has hit the ground running in the Decanting Dept. Liam is supported by Ian Jones, Site Manager and Mentored by Darren Lavill, Operations Manager. Jordan and Charlotte started on a work experience programme at Dunlop Systems and Components whilst students at Exhall Grange School. Both students made excellent progress whilst on placement. So much so that they were both offered apprenticeships with the company once they had completed their Year 13 education. “Dunlop Systems & Components Ltd (DSC) have a close link with Exhall Grange Specialist School due to their close proximity to the factory. Jordan and Charlotte initially joined DSC for a period of work experience in which they were able to show us their abilities and this led to DSC offering an apprenticeship to them. This has been very successful, and I cannot express enough how beneficial to the business Charlotte and Jordan have been. They have both grown into the role of fully fledged valuable employees”. In readiness for their imminent GCSE English Literature examination; Year 11 Literature pupils were treated to a contemporary performance of their set GCSE Shakespeare text Romeo and Juliet. The pupils enjoyed the performance and found it very useful for their revision of Shakespeare’s language and the themes contained within the play. Pupils embarked on a historical and geographical tour of Suffolk. Blessed with sunshine, they spent their first day exploring the exhibits at the Felixstowe museum, experiencing the prisons at the Languard Fort and enjoying a sunny afternoon on the picturesque beach at Languard Point. They then headed back to the YHA at Blaxhall for a fantastic dinner and an evening in the garden.